The crunchy and luscious apples of Himachal Pradesh are once again literally in the eye of the storm, with government estimates saying their overall production is expected to decline with the weather playing havoc. A new Horticulture Department survey says the state is expected to produce 436,000 tonnes or 2.18 crore apple boxes of 20 kg each this season, the second consecutive year of the less-than-normal yield of 2.5 crore boxes. In 2017-18, the apple production was 2.23 crore boxes. “This season the apple crop across the state is poor and the weather is mainly responsible for its decline,” Horticulture Director M L Dhiman told IANS. He said an almost dry and deficit snow season in the past reduced the moisture in the soil, resulting in poor flowering of the crop in spring. The damage, he said, was widely reported from the hills with elevation less than 7,000 feet of Shimla, Kullu and Mandi districts. “The poor moisture in the soil had slowed down the fruit’s initial growth and development. Now the monsoon showers are good and helping the fruits to attain optimum size,” Dhiman added. Farmers and trade insiders, however, say this season the overall apple production, which has been erratic in the state since 2010, is likely to be much less than the government estimates. The weather impact, they said, was lesser for orchards in the higher ranges that were unaffected by the hailstorms in April and May. Horticulture Department officials say harvesting for early apple varieties has begun. “The harvesting of apples has just started and it would pick up speed by the middle of August. We are going to set up 279 collection centres by July 15 for purchasing apples under the market intervention scheme,” Dhiman said. Trade representatives say initial market trends indicate the price of apples will remain higher owing to less crop. Currently, they say, the crop is coming from the lower altitudes (less than 6,000 feet) of Shimla, Kullu and Mandi districts. In the middle reaches, where the crop quality is good, fruit plucking will start by August 15 and will continue till September. The delicious variety of apples from Kinnaur district, known for their natural sweetness, colour and succulence, will hit the markets in mid-October. Early varieties such as Red June, Summer Queen and Tydeman’s Early Worcester, though inferior in quality, are reaching markets in Chandigarh, Punjab, Haryana and Delhi and commanding good prices. Red June is currently being sold in Dhalli, near Shimla, for up to Rs 1,100 a box of 22.5 kg, almost Rs 100-Rs 200 higher than last year, trader Hemant Chauhan said. He said most of the other fruit crops in the region like cherries, pears, peaches, apricots, almonds, and plums are heading for a decline in yield. 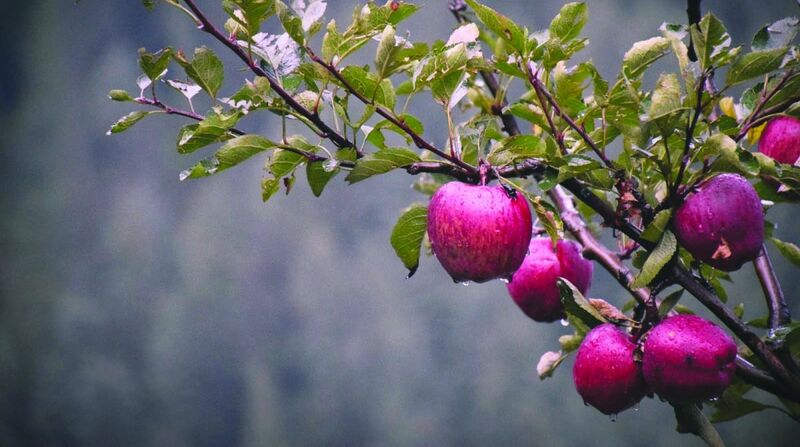 The apple yield in Himachal Pradesh was at an all-time high of 892,000 tonnes in 2010-11. Another fruitful year was 2015-16, with a production of 777,130 tonnes of apples. Apple growers of Kotgarh and its nearby areas last year celebrated a hundred years of fruitful efforts of cultivating the delicious apple varieties. The first apple orchard in the state was planted in Kotgarh in Thanedar panchayat, some 85 km from Shimla, on November 6, 1916, and that had helped Kotgarh to progress economically, socially and also marked its presence on the global map. From a small orchard in Kotgarh, Stokes promoted apple cultivation in other areas too, especially in upper Shimla that currently alone accounts for 80 per cent of state’s total apple production. Before opting for apple cultivation, the locals were planting mainly wheat, maize and pulses. Currently, the Kotgarh-Thanedar area is among those with the highest per capita income in Southeast Asia. The locals have diversified the apple crop by growing cherries, apricots, almonds and nectarines. Besides Shimla, most of the apple cultivation is concentrated in the districts of Kullu, Mandi, Lahaul and Spiti, Kinnaur and Chamba. Surveys of the Horticulture Department show the productivity of apple ranges from six to 11.5 tonnes per hectare in the state, in comparison to 35 to 40 tonnes per hectare in more advanced countries. The area under apple cultivation in Himachal Pradesh has increased from 3,025 hectares in 1960-61 to 112,500 hectares in 2017-18, which constitutes more than 50 per cent of the total area under fruit cultivation.